Laser tattoo removal costs far less than many people think! The rapid increase in laser manufacture has now had the knock on effect of reducing the once prohibitively expensive and unavoidable cost of laser tattoo removal into the reach of most people. Whilst before the process would have likely cost thousands of pounds, you can now get your tattoos removed for a fraction of the price! At Pro Clinics in Bristol, we have deliberately structured our pricing in order for it to be affordable for the masses. We believe that just because you have previously made a mistake in life, you should not have to live with it for the rest of your life. A small tattoo can cost from just £30 per session! !When you also take into consideration that you will only need a session once every six to eight weeks, this really is an incredibly affordable option for people wishing to remove or even fade their old tattoos. Its very difficult to predict exactly how many sessions an individual will require, as it varies considerably from person to person. There are a lot of factors to take into account when assessing a tattoo for removal, such as the age of the tattoo, the type of ink used, the colour of the ink, the location on the body and also how dark the tattoo is. many people are surprised to learn that the darker the colour the easier it is to remove! It is much easier for modern q switched Nd Yag lasers to remove black and grey ink rather than coloured ink.Blue, Green and yellow ink is very difficult to remove as the laser bounces off think ink instead of being absorbed into it as is the case with black ink. Also the process is relativity inexpensive these days, unfortunately there is still a certain level of discomfort that comes with the process. Some people have likened the experience to having an elastic band repeatedly flicked onto the skin, whilst other people report the feeling to be like hot fat splashing onto the skin. There are certain things that can be done to minimise the feeling of pain when having laser tattoo removal session, such as numbing the area with a numbing cream such as Dr Numb or Emla. Other people use an ice pack to cool the area prior to the process. Some people handle the pain better than others and its interesting to see the different responses from people during the process.The actual treatment only takes a matter of minutes (sometimes even seconds) so a lot of people are able to grit their teeth and put up with the pain as its for such a short length of time. Once the treatment ha been carried out, the technician will clean the area, and apply some aloe vera gel to sooth the burning sensation that is felt prior to treatment. At Pro Clinics in Bristol, we also use a sterile dressing to cover the area and advise clients to keep a clean and sterile dressing covering the area for the first couple of weeks. As well as keeping the reea covered, it is important also to follow a few simple rules after you have had laser tattoo removal, such as avoiding bright sunshine after treatment (for this reason it is sensible to start your treatment in the winter when there is not so much sun around!) as well as keeping the tattoo covered and out of the sun, it is also important not to pick and scratch the tattoo after treatment. Blistering is part of the healing process following a session of laser tattoo removal, and can often look pretty nasty.Its important to remember that this is a normal reaction and is nothing to be scared of. As long as the blisters are kept covered and are also kept clean, the tattoo will go on to heal as normal. If people let the area become dirty and don’t look after it properly, this is when complications can arise, Once a tattoo that has had laser tattoo removal becomes infected, there is a significant chance that the area may scar. 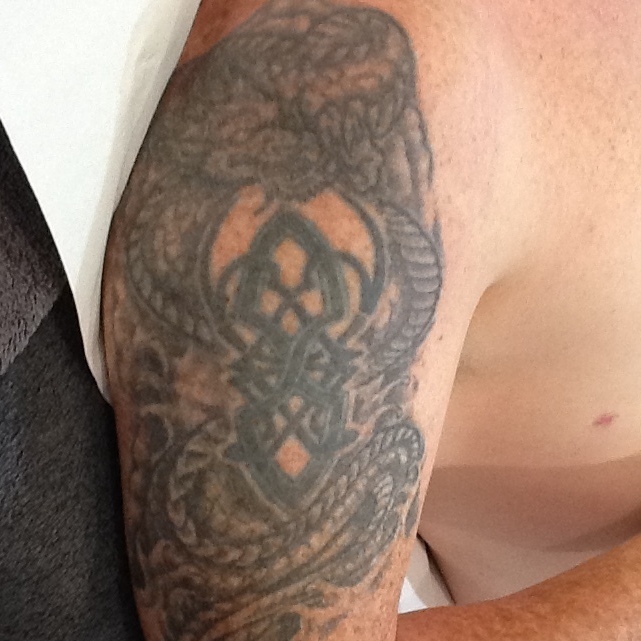 Scaring is unusual during the laser tattoo process, although there is always a slight risk. A patch test prior to treatment should help to determine a persons suitability for laser tattoo removal and all being well if the results of the patch test look ok after a couple of weeks then the whole tattoo can be treated.Laser tattoo removal really is a long an slow process though so the client needs to be fully prepared for this and needs to stick with it in order too see a desirable result. It is not unusual for people to stop the treatment after a few sessions as they realize how long its going to take. They then have the option of visiting a tattoo studio for a cover up design over the top of the original tattoo, although its important to note that a period of time of at lest two months after their last laser session must have passed before they can have a fresh tattoo over the top. It’s also worth spending some time researching tattoo artists in the area, as some are much better than others when designing a cover up design. Some artists even specialize in cover ups.At Pro Clinics in Bristol we see a whole range of people for laser tattoo removal, from young adults being brought in by their parents, to people in the sixties and even seventies!! It’s also worth noting that the older the ink, generally speaking its far easier to remove than fresh ink. This is because modern ink often has various chemicals contained in it that is difficult to remove with laser. It’s hard to judge how a tattoo will respond to laser tattoo removal so that’s one of the reasons that a test patch is so useful when making an initial assessment of a tattoo. This entry was posted in Laser Tattoo Removal and tagged laster tattoo removal, laster tattoo removal information, tattoo removal, tattoo removal information.